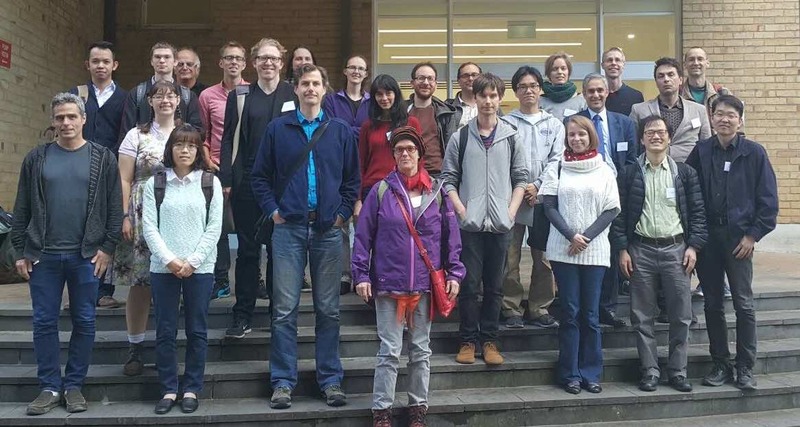 A conference to foster connections among topologists in the Asia-Pacific region. There will be a pair of three-hour lecture series on topics of current interest. The first will be given by Mike Hopkins, and the second will be given by Yong-Geun Oh. The conference will be held at the Parkville campus of The University of Melbourne. 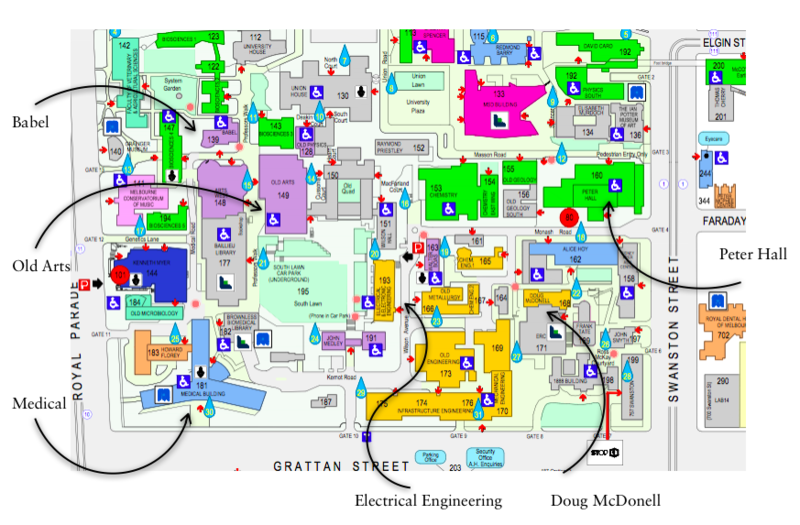 The talks will take place in various theatres across the university; here is a rough map. Gabriel will put his live-texed notes on his website as the conference goes on. Here are slides from Seonjeong Park. This lecture will describe joint work with Dan Freed in which classification problems in condensed matter physics are modeled and solved using Borel equivariant homotopy theory. This lecture will serve as a bridge between Lectures I and III and will describe the unreasonably close relationship between the higher categories that arise in Lecture I and chromatic homotopy theory. This lecture will be devoted to recent joint work with Jacob Lurie on the Brauer group of Morava E-theory. In this lecture series, I will explain how Lagrangian Floer theory works on compact toric manifolds from the point of view of homological mirror symmetry. I will explain a description of Fukaya category of toric manifolds in terms of special collection of Lagrangian fibers and explain the isomorphism between the Frobenius structures of quantum cohomology of toric manifolds and Saito's theory of singularities of the (Landau-Ginzburg) potential function. This lecture is based on the joint works with Fukaya, Ohta and Ono. We begin with an overview of the classification of Poincaré duality complexes using fundamental triples. Applied to Poincaré duality complexes with highly connected universal covers this classification verifies the first part of a conjecture by Turaev. We then establish Turaev’s conjectures on realisation and splitting of such spaces. The classical fundamental group is a coarse invariant for algebraic spaces, oftentimes it is trivial. Grothendieck put forth a categorical version suitable for schemes– called the étale fundamental group. Following this work, we tried to generalize the étale fundamental group for for non-commutative spaces (à la Connes) using covering theory in the form of Hopf-Galois theory. This turns out to be a robust generalization. For instance, the (non-commutative) point has infinitely many connected coverings. In this talk, we will focus on the (non-commutative) coverings of commutative spaces. Using the topological version of Hopf categories, we will give a characterization of such coverings. We explain a (local) homological mirror functor formalism using a single Lagrangian L in a symplectic manifold, which we call local mirror functors. This gives an A-infinity functor from Fukaya category to the matrix factorization category of the potential function of L. In the case of punctured Riemann surfaces, these local functors can be glued to obtain a global mirror, which is a Landau-Ginzburg model on toric Calabi-Yau manifold. This is a joint work in progress with Hansol Hong and Siu-Cheong Lau. Let Diff(Dk) be the space of diffeomorphisms of the k-disc fixing the boundary point wise. Understanding the topology of Diff(Dk) is a longstanding and difficult problem in differential topology. In this talk I will give an overview of our knowledge of the homotopy type of Diff(Dk), focussing on results about the homotopy groups of Diff(Dk). Specifically, I will report on the existence of 8-periodic two-torsion in the homotopy groups of Diff(Dk) for k > 5, which is detected in real K-theory. I will also discuss our (comparative) lack of knowledge concerning the linearisation map Diff(Dk) → Ωk(SOk). This is part of joint work with Thomas Schick and Wolfgang Steimle. Given a finite graph G, I will present a homological algebraic construction which realizes the lattices of integer cuts and flows of G, as parts of the Groethendieck group of a certain module category. Relevant graph theoretic objects will be defined. We'll then discuss dreams and open questions: a theory of quantized lattices, categorical lattice gluing, possible applications to topology. Joint work in progress with Anthony Licata. I describe a family of rigorous differential models for open-closed Landau-Ginzburg theories which result from a partial path-integral localization argument applicable to any non-compact Kahlerian manifold endowed with a holomorphic complex-valued function. Hypercommutative operads are nothing but the homology classes and induced gluing maps of the compactified moduli spaces of pointed curves of g=0. Formal Frobenius manifolds are algebras over this operad. In the original physical context that gave rise to this structure, the representation theory of a certain infinite dimensional Virasoro-type Lie algebra played a crucial role, which is usually ignored in the geometric contexts where Frobenius manifolds appear. The correct mathematical objects to deal with this representation theory are topological vertex operator algebras introduced by Huang-Zhao in '99. We discuss how Frobenius manifolds arise from topological vertex operator algebras, and a few of the application of this relationship. This is a work in progress. Many triangulated categories of interest in connection with geometry, such as derived categories of coherent sheaves, are known to be equivalent to derived categories of A-infinity algebras. In practice, however, it is difficult to compute these algebras. We will explain how categories of matrix factorisations provide an interesting class of examples where one can not only compute the relevant A-infinity algebras, but also the A-infinity modules corresponding to individual matrix factorisations. This work is motivated by an effort to understand work done by mathematical physicists on matrix factorisations and their moduli in the context of topological string theory. A family of closed manifolds is called cohomologically rigid if a cohomology ring isomorphism implies a diffeomorphism for any two manifolds in the family. In this talk, we present a recent result on cohomological rigidity for large families of 3-dimensional and 6-dimensional manifolds defined by right-angled 3-dimensional polytopes. We consider the class 풫 of 3-dimensional combinatorial simple polytopes P, different from a tetrahedron, whose facets do not form 3-belts or 4-belts. By a theorem of Pogorelov, each polytope from 풫 admits a right-angled realization in Lobachevsky 3-space, which is unique up to isometry. Our families of smooth manifolds are associated with polytopes from the class 풫. The first family consists of 3-dimensional small covers of polytopes from 풫, or hyperbolic 3-manifolds of Löbell type. The second family consists of 6-dimensional quasitoric manifolds over polytopes from 풫. This talk is based on the joint work with Buchstaber, Erokhovets, Masuda, and Panov. A Hurwitz space is a moduli space for branched covers (in our case of A¹). In this talk, I will define what a quantum shuffle algebra is, and relate its cohomology to the homology of Hurwitz spaces. If time permits, I will discuss how this relation can be used to prove the upper bound in Malle's conjecture for function fields. This is joint work with Jordan Ellenberg and Craig Westerland. The Poincaré-Birkhoff-Witt and Milnor-Moore theorems are fundamental tools for understanding the structure of Hopf algebras. Part of the classification of pointed Hopf algebras involves a notion of “braided Hopf algebras.” I will present recent work which establishes analogues of the Poincaré-Birkhoff-Witt and Milnor-Moore theorems in this setting. The main new tool is a braided analogue of a Lie algebra defined in terms of braided operads. This can be used to establish these results, as well as a proof of the Andruskiewitsch-Schneider conjecture on generation of pointed Hopf algebras. Additionally, there appears to be an unexpected connection to profinite braid groups and related operads. The SkyBus goes from the Melbourne airport to the city and costs less than $20. It goes to the Southern Cross station, and also has a hotel shuttle service for many hotels. Alternatively, you may take a taxi from the airport or explore other options. For travel within the city, please consult Public Transport Victoria. Registration should be done by filling out this form. There is a registration fee of 25 AUD which will be collected at the conference. Most international participants will need a visa to enter Australia, and should consult the website of the department of immigration and border protection for more information. Students or early career researchers from AMSI member universities without access to a suitable research grant or other source of funding may apply to the Head of Mathematical Sciences for subsidy of travel and accommodation out of the departmental travel allowance. Organized by Vigleik Angeltveit, Gabriel C. Drummond-Cole, Philip Hackney, and Marcy Robertson.